The Samsung Galaxy S4 is the reigning king, the champion of Android sales, and it’s been so for nearly half a year with almost no competition. Now, LG has come up with a competitor - the LG G2, a device with a larger display, better ergonomics, faster chips and camera with optical image stabilization. Can the Galaxy S4 still hold its ground? Or has time finally taken its toll? 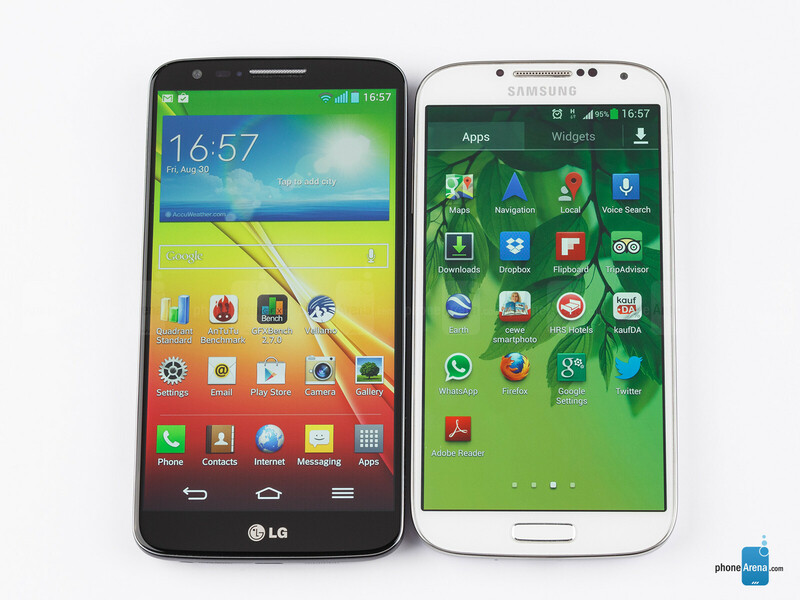 And is the LG G2 the new Android hero device? Let’s find out. 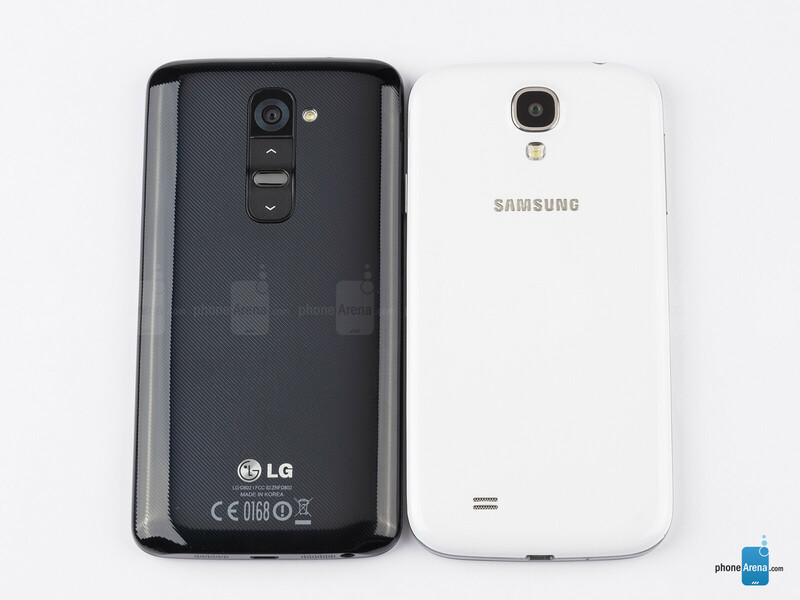 Two polycarbonate handsets, the Samsung Galaxy S4 and LG G2 are both similar yet very different in terms of design and actual feel. The Galaxy S4 is flat, with no curves on its back, so when you hold it the palm of your hand kind of bumps into its edges. The slightly thicker LG G2 on the other hand follows the curves of your palm and nestles in it so very comfortably that it’d fool you for being the slimmer one (it’s not). A usually boring subject like the buttons becomes interesting with the LG G2. The G2 simply lacks buttons on the sides as all of them have fled to the back. That’s right, the volume and lock keys are all on the back of the G2, right below its main camera and our initial feedback is extremely positive. This new positioning makes a lot of sense - your fingers are always there and you don’t have to reach out far and adjust the phone in your hand when trying to press a button. 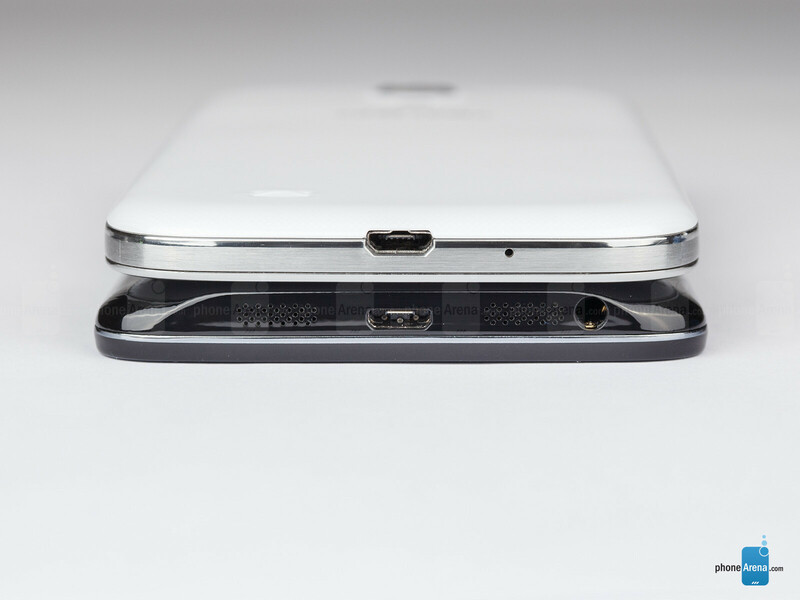 The Galaxy S4 on the other hand uses traditionally placed buttons on the sides. 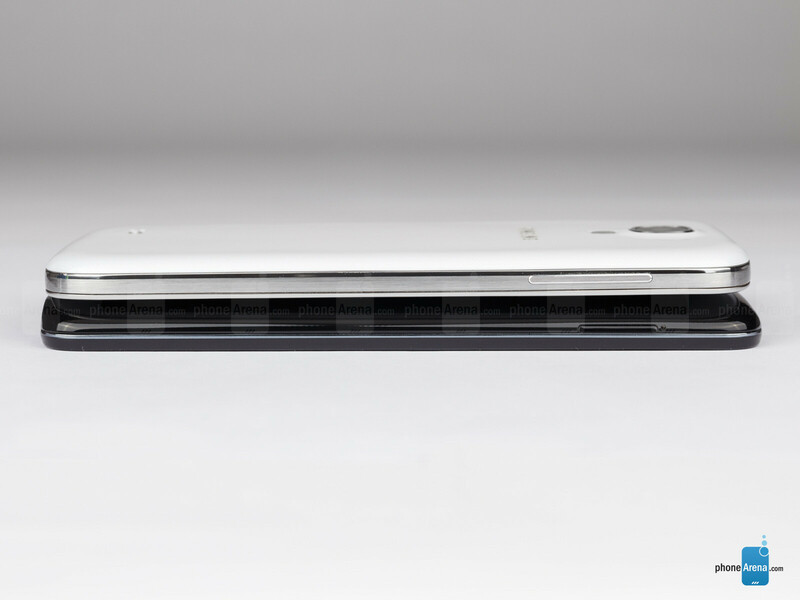 We ought to mention LG’s amazing work on making the G2 so compact. The handset comes with extremely slim bezels and manages to be of virtually the same size as the S4, but still have a 0.2” larger display. Nicely done. The screen size on both devices however takes its toll and you’d find it hard using each of the devices single-handedly. Last but not least, the actual build quality is solid on both devices - there are no screaking parts and everything is well put together. LG’s great work on thinning down bezels allowed it to include a 5.2-inch display in the G2, slightly bigger than the 5-inch one on the Galaxy S4. The screen technology the two use, however, differs and so does the image quality. LG has gone with traditional IPS LCD (full RGB matrix) while Samsung uses an AMOLED panel (PenTile with Diamond Pixels). Both are extremely sharp and detailed, featuring a 1080 x 1920 pixel resolution, but the G2 is one step ahead with the slightly crisper image (but the difference is barely noticeable). There is one thing, though, that will make you tell the two apart easily. That is the colors. The G2 has very lively, true to life tones for the most part, while colors on the S4 are clearly overblown. Whites on both are a bit colder than we'd like, and you can see a slight blueish undertone. 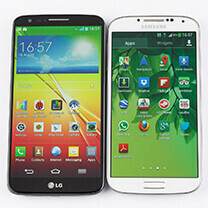 LG also has a much brighter, vivid display against a comparatively dim screen on the Galaxy S4. The higher luminance of the LG display gives it the edge in terms of outdoor use, and we appreciate that!. All in all, we’d give the display honors to the more accurate and brighter screen of the G2. They have the same looks..
LG takes what works and boosts it to the next level. ...winner only because of a bit bigger screen - which i find nice as a previous NOTE user, now with S4 i am happy to handle smaller phone in one hand and i could manage those 5,2 thin bezels comfortably... ...BUT - those back buttons is FAIL!!!! I dont care what maker, but samsung only (and iphone) have physical button which is the most comfortable thing to unlock your phone with one hand. Everything else, if on the back or on the top needs tricky fingerplay to unlock.... Using Samsung, or Iphone is pretty straightforward - just pick your phone and thumb does it in one shot... So for me, "iphonish" button is a must! Overall, i am happy to see LG jumping into high-end segment at this way, probably after back buttons they will bring something better that they invent on their own. You are forgetting double tap screen wake on the LG. I think it's more comfortable to tap the screen, than pushing a physical button (and I'm a GS4 user right now). The trick is that you don't need to search for the button with your finger, you can double tap the screen anywhere you want to. Oh yeah, another thing. Phonearena!!!! Please update your benchmark results when you get a retail unit. I think your numbers are not useable, because in other benchmark comparisons (gsmarena to be precise) the G2 wipes the floor with the competition, it even beats the Z Ultra. I agree with you. I still prefer the LG optmius G Pro over the G2 cause of physical button and i hope the next LG G2 Pro comes with physical button with the same design as LG G2. I'll choose G2. LG managed to score a home run with this beast. S4 no way a bad phone though. What half a year does. Up to this point the S4 was The Flagship, now the G2 is the new champion, then will come the S5 and the G3 etc... LG learnt the best from Samsung (even if a little too obviously, G variants of S-beam, S-view cover, multitasking, camera interface and sensor, phone looks and materials, colorful UI etc. ), and that's good news for us cause we have a choice. Technology is too fast mate. Sammy is coming with Note III. Better photos etc. What I don´t like is the size. I´ll go to LG. I like the new G2. Anyone else saw the difference between the full review of the G2 and the comparison in here? In the review the writer admitted that the LG's back was poorly manufactured, mainly when he noted that the creaking sounds made by the back were extremely irritating. Then he went to say how the G2's screen needs improvement and it has cold colors compared to competitors. I chose not to continue reading this review because something smells fishy, maybe LG forgot to dorp them their paychecks. Agree something doesn't seem right here.. Review complains about build, call quality, screen and in the comparison there's issues intact build and call quality is now excellent. Maybe other person done it. Nothing fishy about it. NEVER underestimate how varied human error can get. I like to call it human stupidity. My second major is psychology and you would be amazed by the results of some of the human perception tests we did. Long story short, people are retarded. One of the major ones I notice is this IMAGINARY creaking metal lovers like to place on plastic phones that are solid as a rock. Actually, it doesn't even have to do with plastic, it more has to do if they hate the company or the type of plastic. For example, the Lumia 920 actually does have creaking near the ffc camera where test gets in but you'll never hear a single complaint because retards like matte plastic. But solidly built phone with very low clearance between parts and the shell like the G2 and GS4 get imaginary creaking because their plastic is glossy. 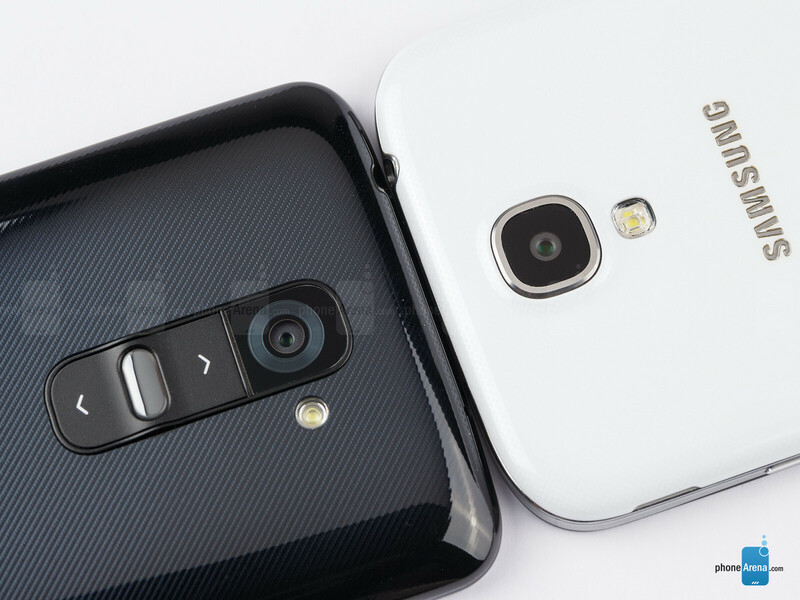 The GS4 literally has no room to creak, that is how tightly packed it is yet it somehow does to HTC and Nokia fan boys. lol I think the same thing applies here. 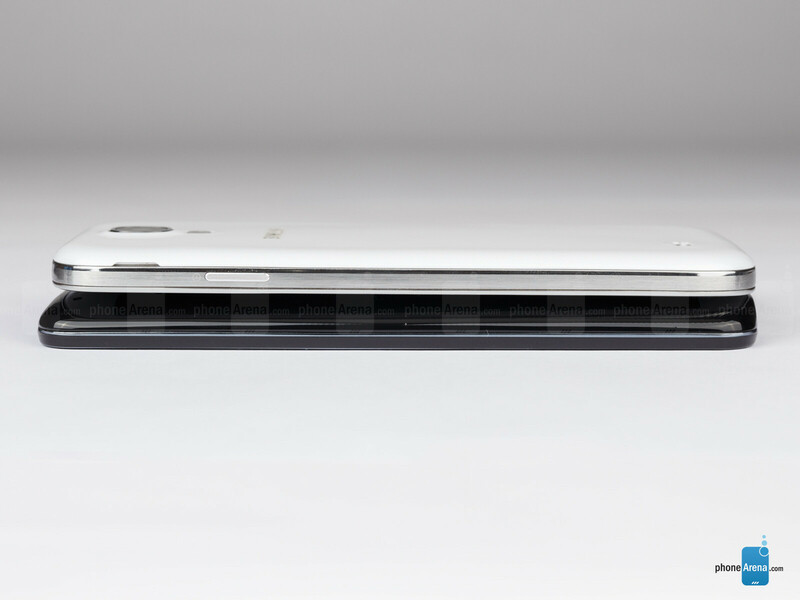 Although their might be some clearance on this step rounded battery LG made. You would still have to push really damn hard for any give. And the winner is............ The LG G2. If the bootloader is unlockable on the G2 when it comes out on Verizon I would considered it. Otherwise I'm looking at the Note 3 if it comes with 3gigs of ram, removable battery and SD card slot. My only drawback on the Note 3 is if the screen is darker than the G2 and price. Unlockable bootloader? On Verizon??!???!! Don't hold your breath. Seriously. I love LG's UI, except for the notification shade. Over half of it is just filled with toggles, sliders, and QSlide apps. There's barely any room for notifications! Otherwise, it's a very nice skin. LG's been bringing the heat lately. Better watch out Samsung, if LG keeps this up, you'll be in trouble within a couple years. You can probably remove some or all of that stuff from the notification shade like you can on the S4. I've dug through all the settings on my L9, you can't remove anything from it. You can delete all the app options for QSlide, but then you're just left with an empty grey space in the notification shade. No option to remove the brightness slider or quick toggles at all (which I actually don't mind). Maybe they added it in the newer version on the G2, but I doubt it. I gotcha. I just figured with LG trying so hard to be like Samsung lately that they would have included that functionality also. But like you said, it could still be in there.